Commissioned in 1912 as the Taichung State Building during the Japanese occupation period, the wood and resistant brick hall was completed after 12 years. During that time, it was regarded as one of the most ornate and stunning structures of the Japanese colonial government in Taiwan. In 1949, the management of Taichung was surrendered to the Nationalist government and was renamed as Taichung City Hall. The historic building underwent a major facelift using grander-than-average architectural and construction scale and concepts as well as a new lighting system to further highlight the overall grandeur of this splendid old relic. 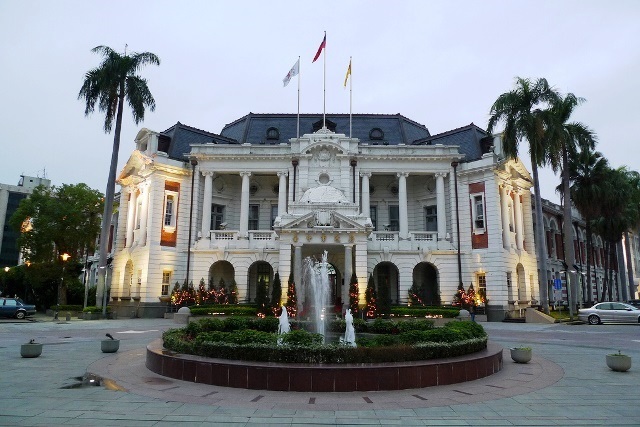 During the leadership of Jason Hu, the Taichung City Hall underwent serious reconstruction although its ancient architectural features have been retained. Among the latest features of the new city hall is the LED screen, which is the biggest in Asia, and a wide pedestrian-only plaza near to the vehicles. According to the mayor, the new Taichung City Hall Plaza can accommodate about 20,000 to 30,000 people and is open for various social activities such as group exercises. The area is also used for different children’s recreational activities such as bicycling, skateboarding, playing and similar purposes. On the other hand, the 20-meters long, 26-meters high LED display inside the City Hall Plaza is the biggest full-color LED screen in Asia. Its vivid display, together with the artistic lights adorning it are used for countdown shows, sports games, showing movies and complementing the plaza during special social events or fairs to supplement a fantastic public recreational area. Regarding the new city hall’s overall design, both the City Hall and the City Council structures were designed by the Weber-Hofer AG Architects. This is the first construction in the country to integrate both the city council and city government facilities. Today, almost all celebrations and festivities are organized in front of the Taichung City Hall such as the National Flag ceremony, floral and artwork exhibitions and more. A new lighting system has been installed that serves to highlight the Roman columns, rooftop, main arch and the Baroque-style dormant windows, making the building one of the most picturesque structures in Taichung during evening. In addition, different colors of lamps are installed on each floor. The lighting system’s purpose is to match to the city’s stunning night view and enhance the tourism in Taichung, particularly in Central Taichung and West District. Access to Taichung City Hall is very easy as it is a popular landmark and historical spot in Taichung region. Some of the nearest places of interest include Wu Quan Parkway and Sogo Department Store. Each year, more and more visitors come to visit this historical spot, eager to witness the building’s unique architecture.